I’m skeptical the first time I see a Joshua tree. This is what a Joshua tree looks like. Cactus-meets-palm tree-meets-fictional Lorax. The closer we get to the park, the more of these strange trees we see. 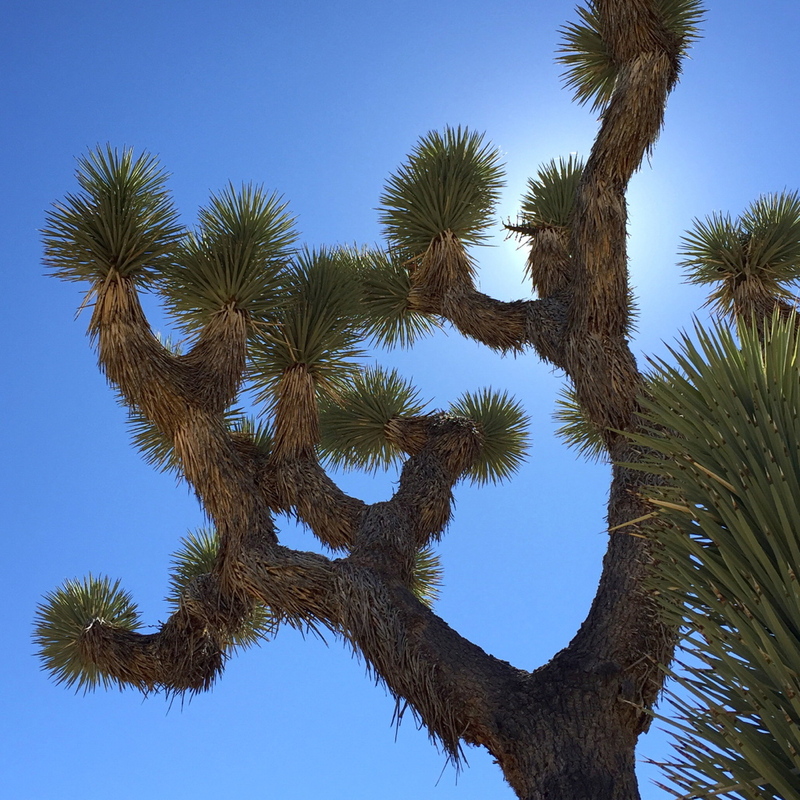 It becomes obvious that the trees that look like cactus-palm hybrids, reaching toward the heavens with outstretched arms, are indeed Joshua trees. They’re so cool-looking that a national park is named after them. Also, you might have heard of The Joshua Tree, U2’s best-selling album. Evidently, Bono thought that anything that could live in the harsh desert environment and not just survive but thrive, should become the symbol for the band’s fifth musical endeavour, says George Land, community outreach for the park, who guides us around for the day. “That album really introduced the tree to the world and gave it international notoriety,” says Land. Almost 30 years after the album’s release, two million visitors come to Joshua Tree National Park each year to see the trees growing on parched ground and in between fantastical clusters of red granite rocks. The park protects a desert ecosystem — the Colorado and Mojave deserts come together here — that spans 800,000 acres (larger than Rhode Island) and is home to 17 different kinds of cacti, plus reptiles, birds and mammals. Even though it’s midday and the sun is beating down a scorching (for February) 29C, we see a jack rabbit hopping through scrub from a distance. But the show-stoppers are the red rocks, and the green-and-gold Dr. Seuss-like trees set against a blue sky. 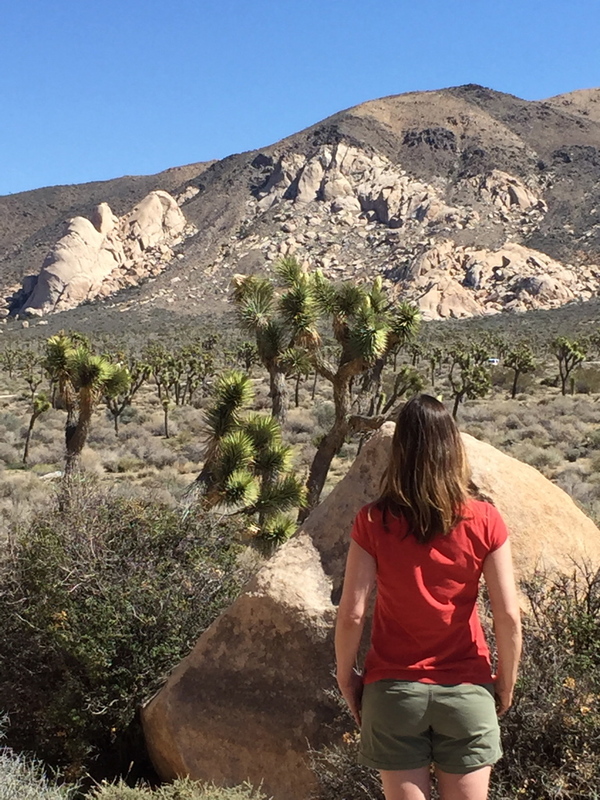 That’s me contemplating the scenery at Joshua Tree National Park. I’m no stranger to natural places purported to have magical powers or healing properties. While exploring Machu Picchu in Peru, I settled my hands on a wall that celebrity and New Age proponent Shirley MacLaine had, during an earlier visit, declared to be a source of mystical energy. 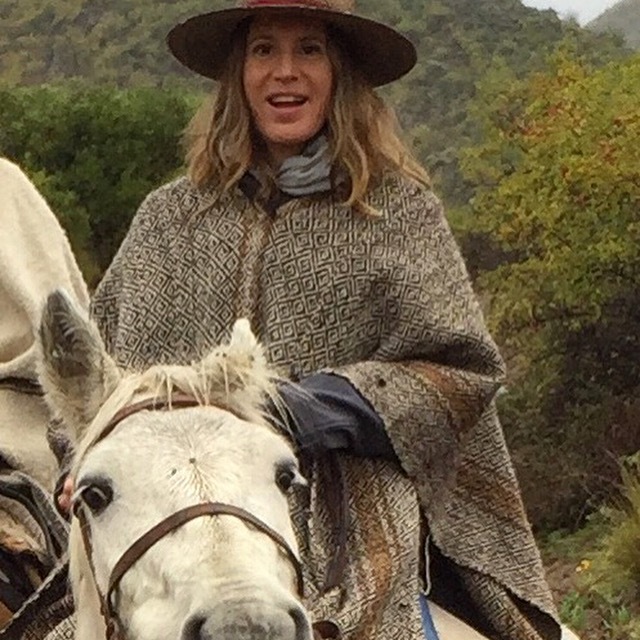 I was in awe of the ancient Incan city, but all I felt was a cold rock. In other words, if it possessed New Age powers, they were lost on me. In Sedona, Ariz. we visited a few of the supposed vortexes and I waited for a kind of mental calm or spiritual tingling to overcome me. Again, nothing. I saw pretty rocks in a surreal landscape. 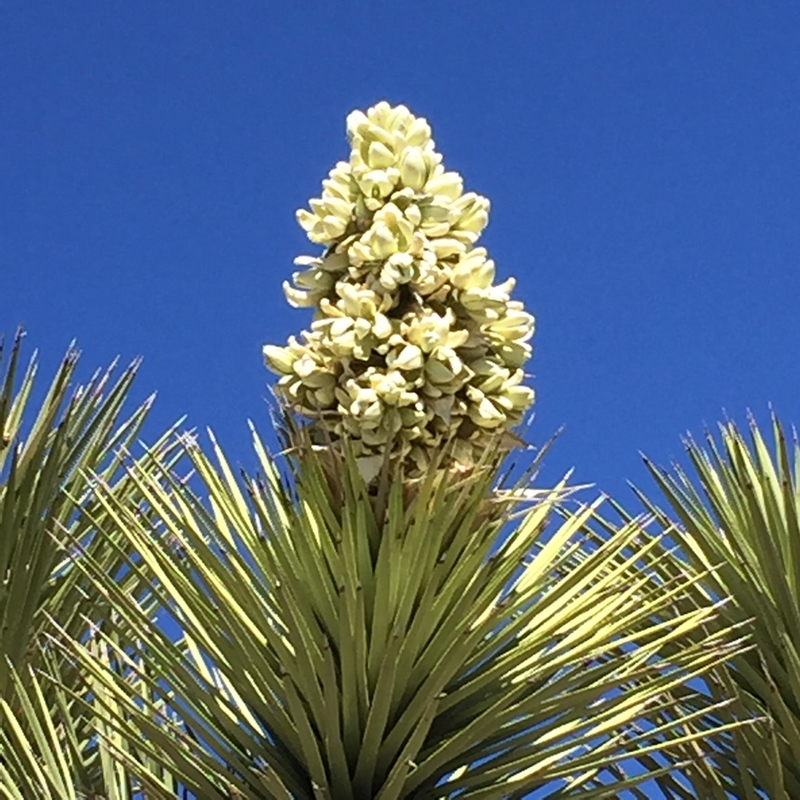 If you visit the park in late-February/early-March, you’ll see the Joshua trees in full bloom. In Joshua Tree, I don’t close my eyes and wait for an epiphany. Instead, I take in the phantasmic sweep of red, rounded rocks erupting out of mountains, and blooming Joshua trees reaching skyward. Perhaps the landscape’s power lies in its ability to bewitch from beauty alone? If that’s the case, the creative souls before me have come by their inspiration honestly. We listed our Fernie condo over the Christmas holidays. For 10 years it’s been our mountain retreat in summer and winter; during every three-hour drive I’ve sighed audibly as our car spirited us from Calgary to our happy place. 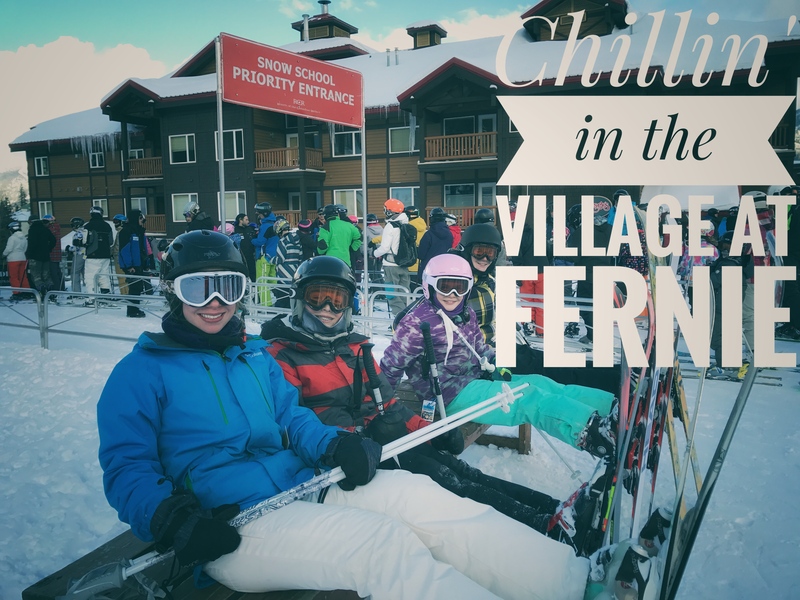 Fernie is where both of our children learned to ski. It’s the place we spent perfect summer days at Surveyor’s Lake. It’s the site of multiple hikes and even a mountain summit. I could wax nostalgic for hours, but we are ready to move on. 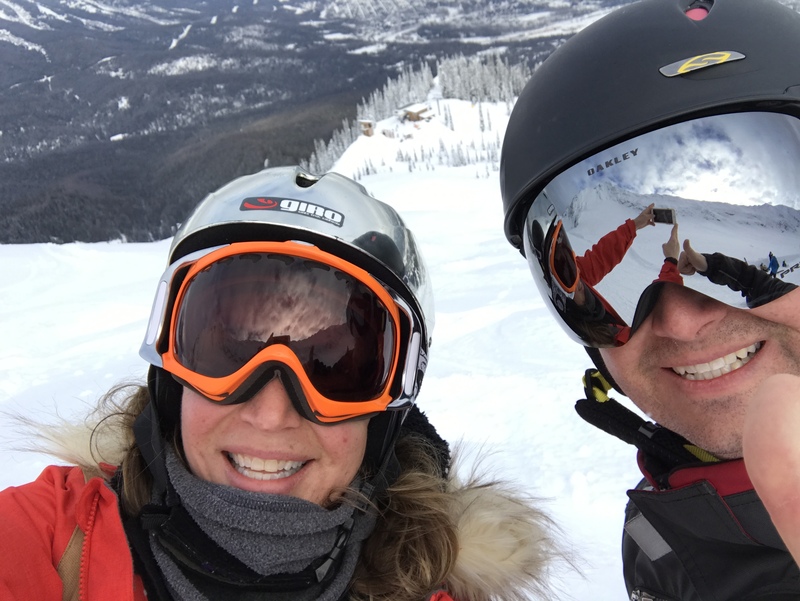 It’s time for some new adventures, and I feel happy at the thought that perhaps another family will buy our condo and fall in love with this cool mountain town, its challenging ski hill and its many hiking and mountain biking trails. 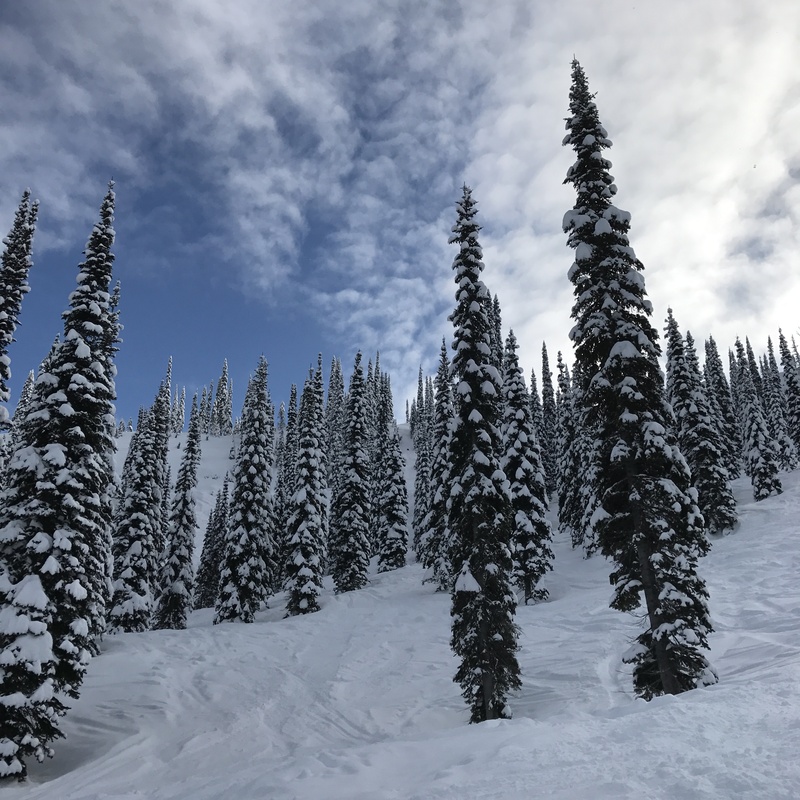 In honour of a decade spent in Fernie, I’ve listed — in no particular order — all the things that make it a special place to spend a winter day (or evening). 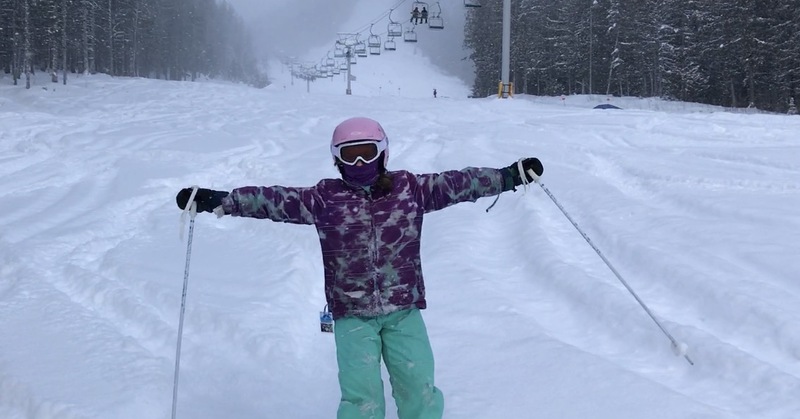 This isn’t a regular occurrence, but for some reason on this particular Monday afternoon, after a dump, my daughter and I found endless stashes of untracked powder on either side of, and just below, the terrain park. 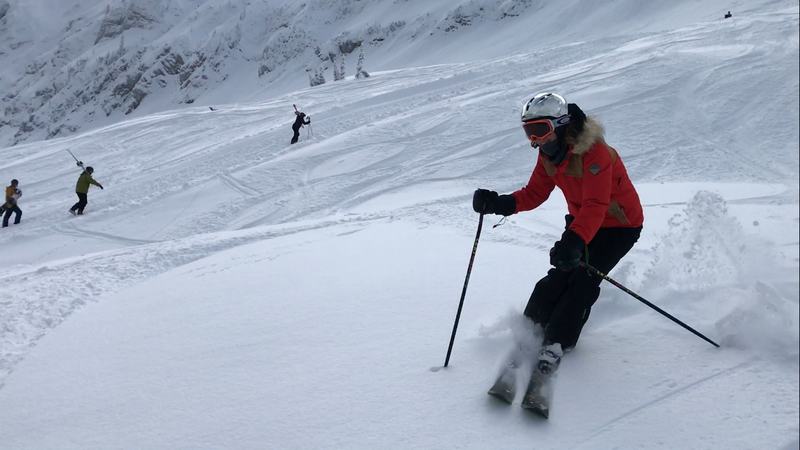 It was basically a virgin field on a green run, which is perfect for a newbie powder hound like Avery. Just shreddin’ off Deer chair. Sometimes, timing is everything. That was certainly the case this past Sunday, when a friend and I noticed they had just opened Upper Lizard Bowl, allowing skiers to hike up to access the yet-to-be-skied snow field directly under the fearsome cliff walls of the Lizard Range (these slopes are often closed as regular blasting triggers avalanches that sweep the unblemished surface below). This made my last run of the weekend epic. Look, Ma! We hiked up all this way! It’s 20 minutes hiking up and exactly 36 seconds skiing down. But worth it! 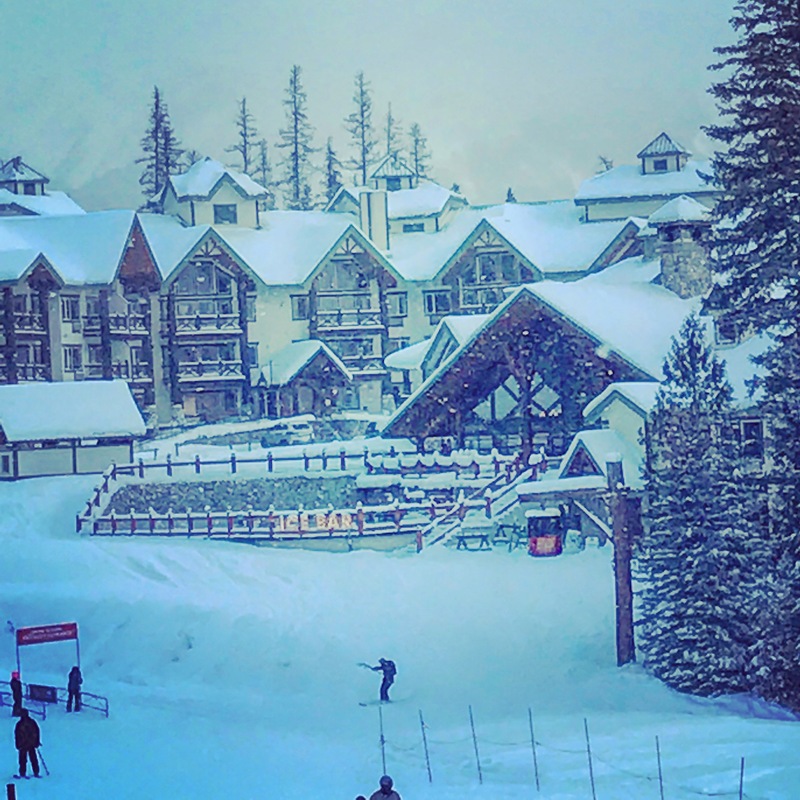 Back when I skied Vail, the resort was so vast and the village so large, I had no hope of meeting up with friends unless I showed up at the top of Chair 11 at 11 a.m. (a rendezvous colloquially known as 11 at 11 or “11:11”). Also, there were chalkboards at each lift for scrawling messages (this was before iPhones). At Fernie Alpine Resort, wait five minutes and a Califernian whom you know will ski by. Not many ski resorts boast frozen vodka Ice Bars, like the one in Cirque restaurant inside the Lizard Creek Lodge. 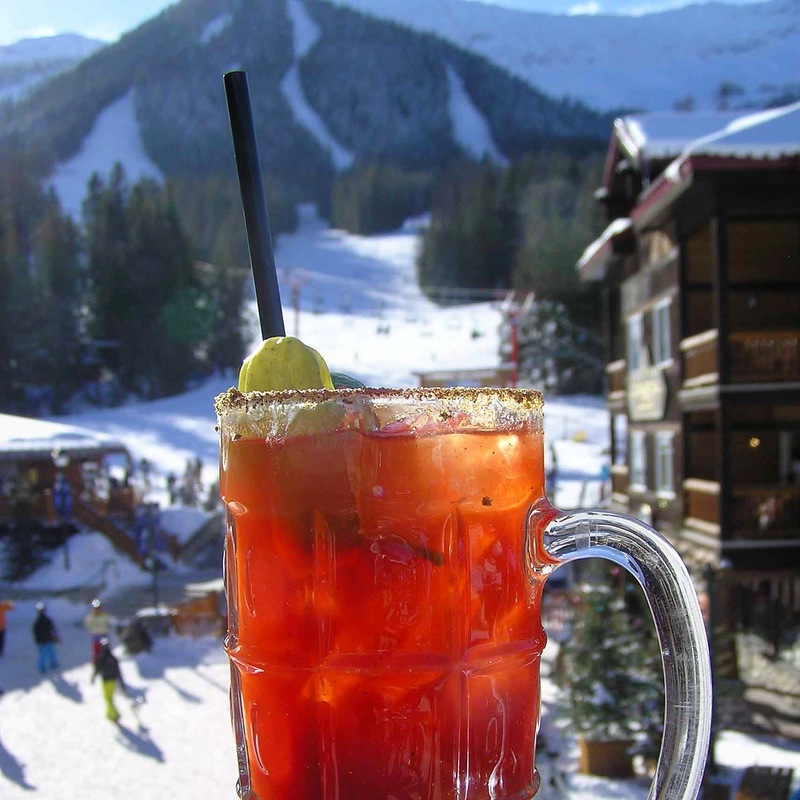 Or patios like the one at The Griz Bar, where you can place your Caesar in such a way it looks possible to ski down the straw from the hill. Between the mountain and the town there are over 20 bars — Fernie really takes hydration seriously! This was my view in Cedar Bowl on the weekend. There was only one other person skiing in the vicinity. It kind of baffles me, actually. 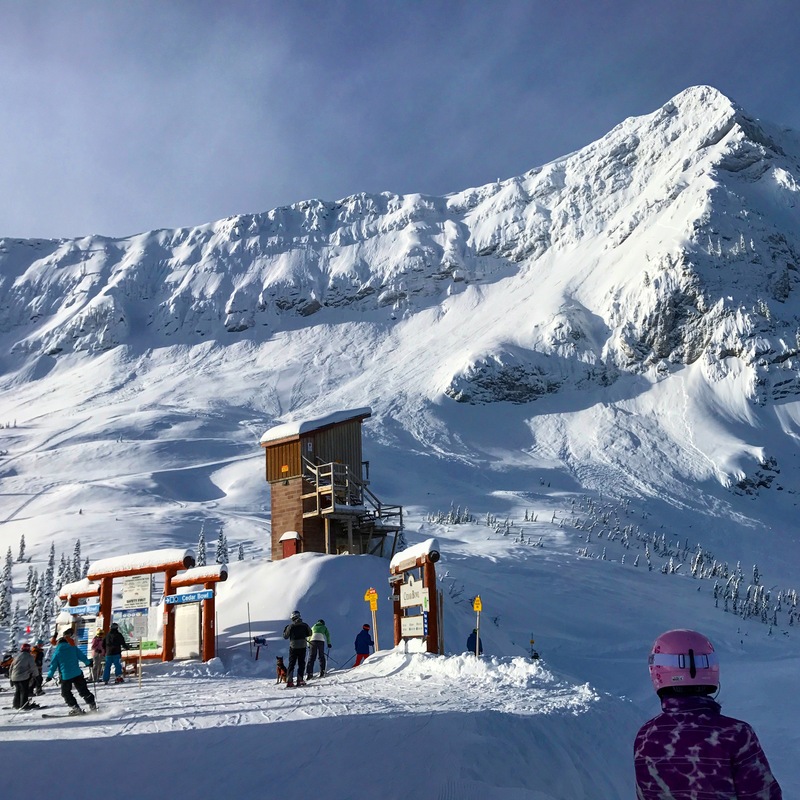 Here you’ve got a resort with a much larger snow base and better conditions than most Alberta hills, but because it’s a farther drive there are way fewer skiers. That alone makes it worth the extra miles. Little known fact: If you look up at the treeline from a steep run you can feel the Earth turning. Those crazy jagged, cliffy mountains again. Fernie has one of the most comprehensive avalanche programs in North America. On almost every morning after a snowfall you can hear the team blasting. Some mornings, they drop charges from a helicopter. It’s fair to say the scenery comes at a cost (but again, it’s worth it!). Morning light in Lizard Bowl. For $20, we can drop off Bennett with two volunteer instructors every Sunday afternoon for a private ski lesson that includes a lift ticket. How cool is that? 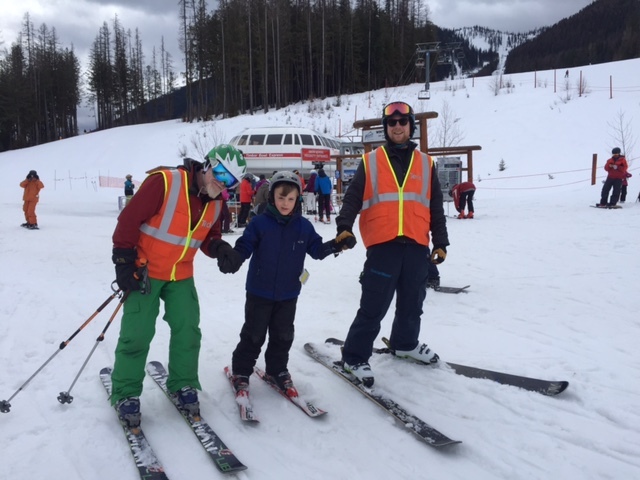 Volunteer instructors with the Fernie Adaptive Ski Program help Bennett. Watching the mayhem when the Curry Bowl sign line comes down is the best thing ever! This might be your one chance to ski in a Chinese downhill over fresh snow. 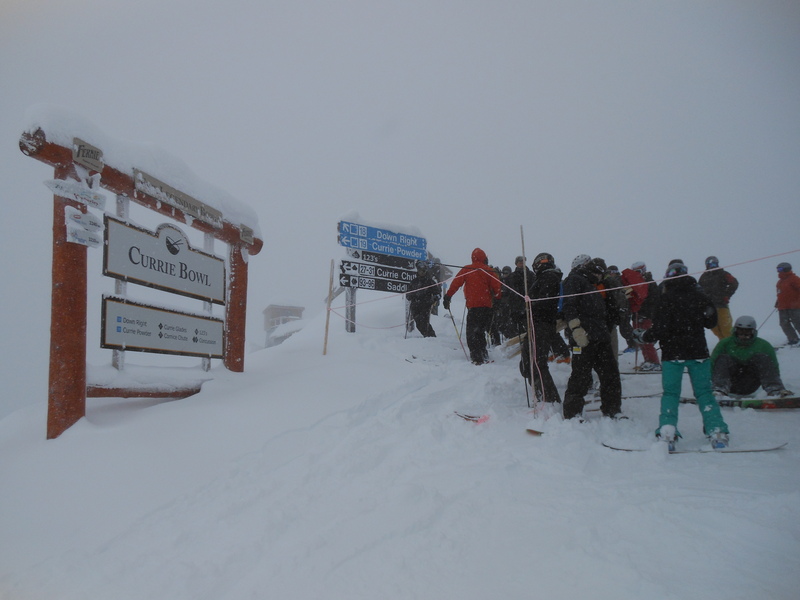 The throng gathers at the top of Currie Bowl on a powder morning, waiting for the sign line to come down. One of the coolest story assignments I’ve had in recent years involved cat skiing at Island Lake with Blake and rekindling our love affair with snow. 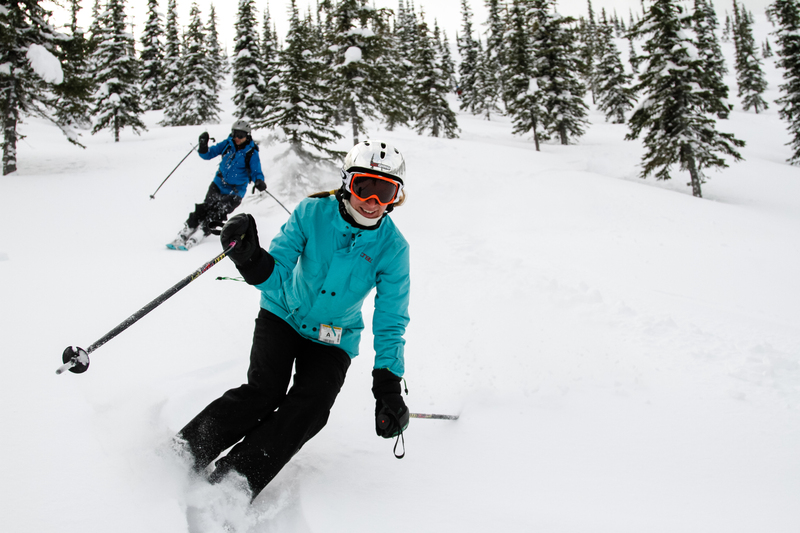 If you’re an avid skier, this experience is a must. Blake chases me through the powder at Island Lake Lodge. Photo by Nick Nault. Fernie also has the best sushi in Calgary! I wrote a story some years back about the town’s growing food scene. Restaurants have come and gone since then, but Yamagoya stays strong and makes a West Fernie roll like nobody’s business. And make sure you stop in at Big Bang Bagels and order the Switchback Salmon sandwich. 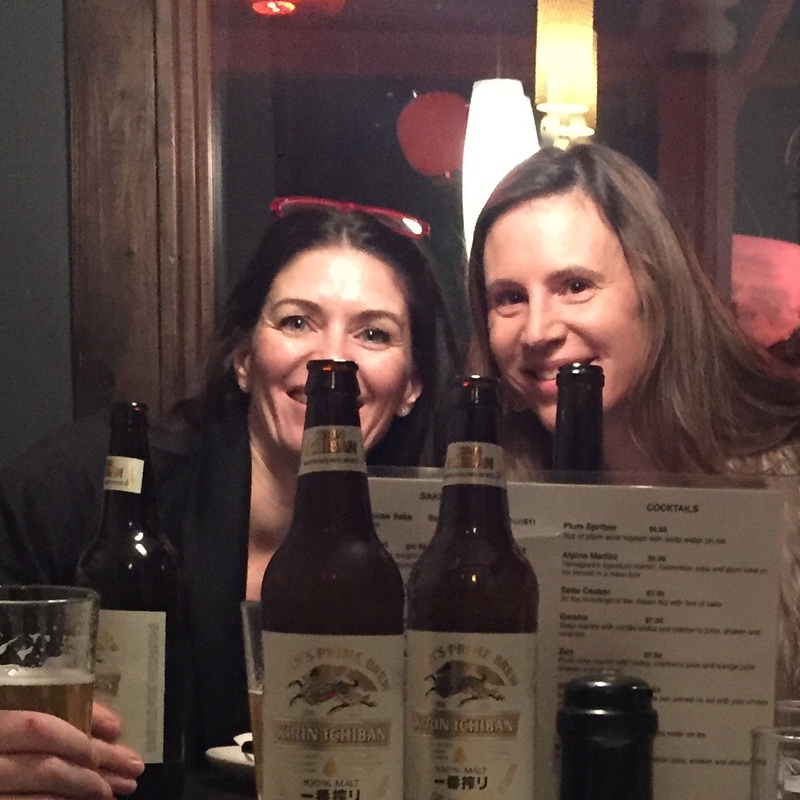 We’ve spent many nights eating delicious rolls, drinking biggie beers and laughing our heads off at Yamagoya. What was once a mining town has turned to tourism. The historic buildings now house boutiques, gear shops, restaurants and bars. 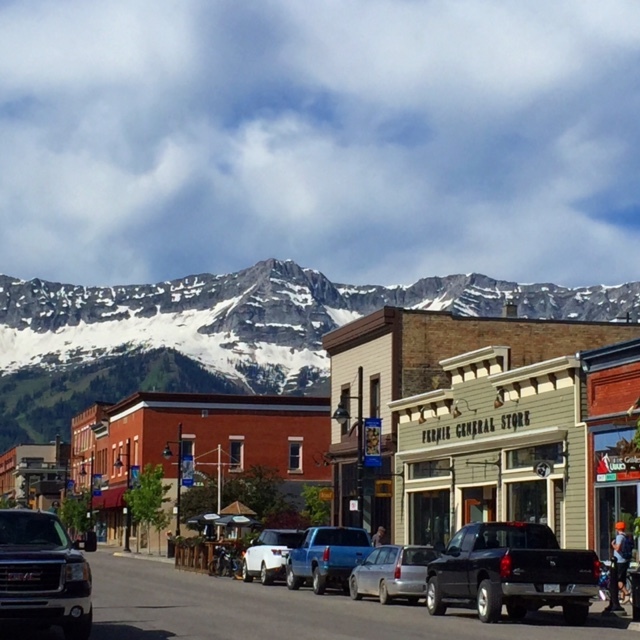 Not only does downtown Fernie have a gorgeous setting, it has charm galore, with cute boutiques and great restaurants. Moving on doesn’t mean never coming back. Even after the condo sells, I know we’ll still be regular visitors to this piece of Kootenay paradise. There’s something magical about a train trestle. 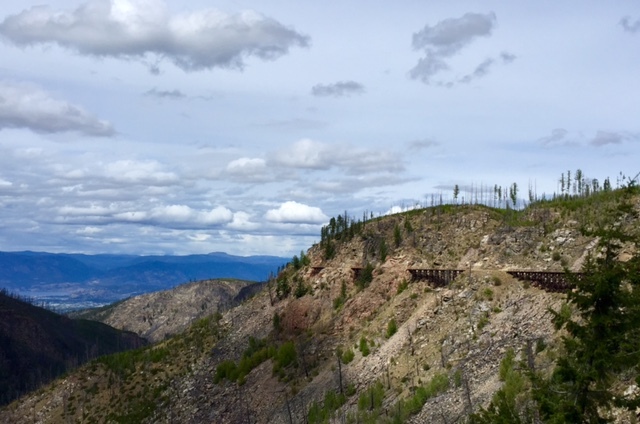 Multiply that by 18, add in two tunnels and tons of views and you’ve got the makings of a great hike (or bike ride) along the old Kettle Valley Railway (KVR) line that curves around Myra Canyon in Kelowna, B.C. 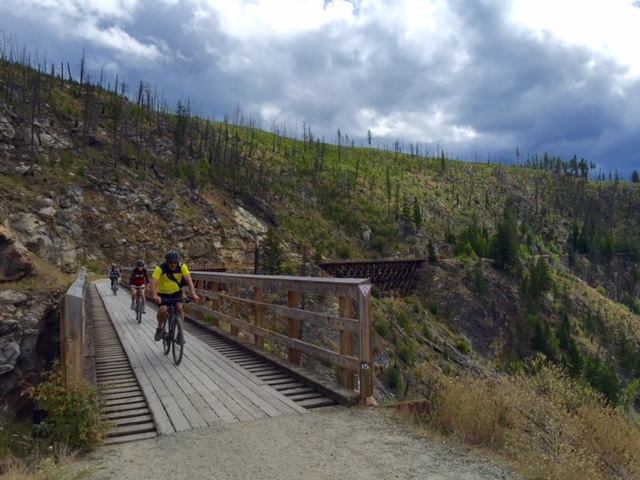 Expect great views of while hiking or cycling the Kettle Valley Railway trail that curves around Myra Canyon in Kelowna, B.C. You also cross 18 wooden train trestles like the one pictured above. My husband and I had known about the KVR trail for years. This part of the old railway has been restored by a group of volunteers a couple of times. Initially, in the 1990s, they made the 18 trestles safe for recreation. Then, after the devastating wildfire in 2003, they reconstructed the damaged trestles, a project that took nearly five years. 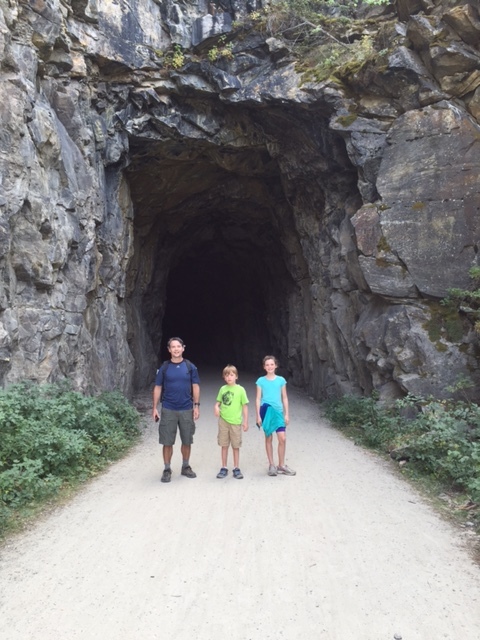 So this past summer, during a quick two-day stay in Kelowna, we set out with the kids, bag lunches and lots of water to hike the most epic portion — the 2.5 kilometres between trestle 18 and the second tunnel, for a round trip of 5k (a perfect distance for kids!). You can even see Okanagan Lake from the trail. Yes, this meant we were essentially hiking backwards from the terminus trailhead at Myra Station, but lots of other people seemed to have the same idea. And no wonder — we crossed seven trestles of varying lengths and heights, and enjoyed views of the other trestles across the canyon. It’s a popular cycling trail, too, and most of the two-wheelers seemed to be making a day of it by pedalling the entire, mostly-flat, 12-kilometre trail in one direction, turning around, and then cycling back again (for an easy 24k ride). Next time we visit we are going to bring our bikes! With the lure of an afternoon spent swimming at the pool complex at Manteo Resort, our lakefront lodgings, we turned around on the other side of the tunnel and headed back to the car. 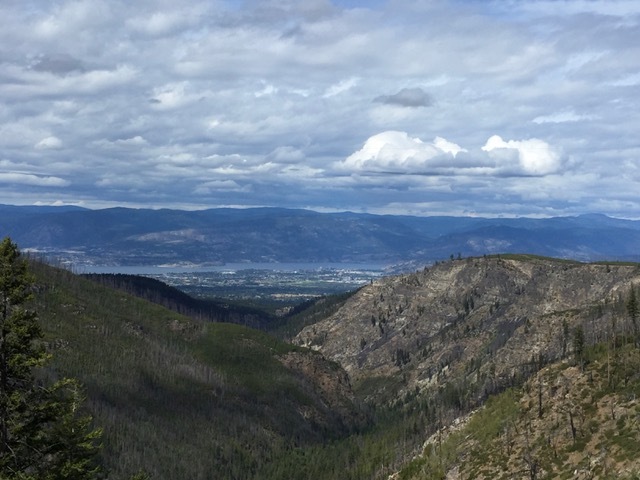 In all, it was a fun outing that combined exercise with pretty Okanagan scenery and a bit of the area’s history (there are interpretive signs that detail the region’s railway past). 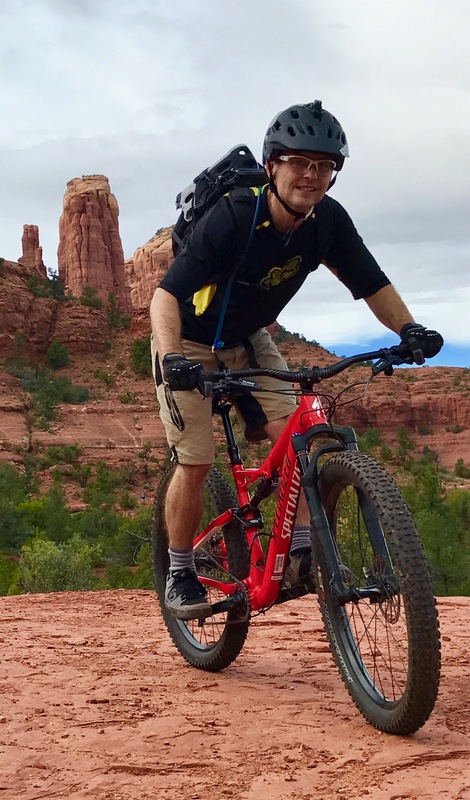 We’ll definitely be back to hike or cycle the entire trail! One of two old train tunnels along the Kettle Valley Railway trail in Myra Canyon near Kelowna. 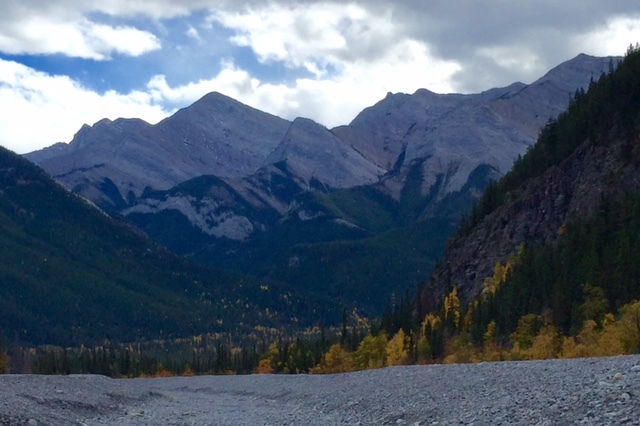 The limestone walls on either side of Jura Creek canyon near Exshaw, Alta. beckon like the lost city of Petra. Only, instead of manmade buildings hewn from rock, your little explorers will find treasures of the all-natural kind: “staircases” of rocks and boulders to clamber up, “railings” made from logs wedged between cliff walls and “sinks” shimmering with crystal clear pools of water trapped in shallow rocky depressions. 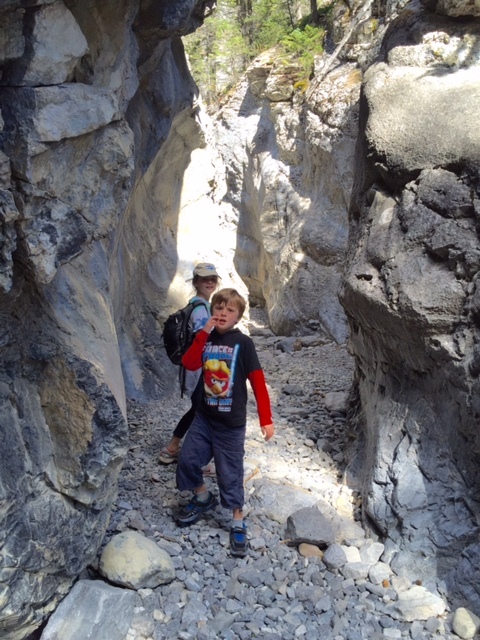 For kids, there’s nothing more enticing than a narrow chasm to squeeze into and dry waterfalls to scramble up, and the thrills don’t really stop on the way back because you have to navigate the trail in reverse. The kids loved scrambling up this ledge at the entrance to Jura Creek. Ominously, not 50 feet in to the canyon we spotted a trail of blood (ostensibly from an injured rock climber or hiker exiting Jura Creek) and followed it all the way up, which lent our little adventure a Blair Witch vibe on a cool fall afternoon. I had never even heard of Jura Creek until this past weekend. Nearby Grotto Canyon gets all the glory and perhaps that’s not a bad thing — we had the canyon and all of its kid-pleasing obstacles to ourselves for most of the hike. The canyon gets quite narrow in parts, and you can imagine the floodwaters of 2013 sluicing through the slots with force. This narrow canyon has been eroded to reveal smooth limestone walls that curve and swoop as spring runoff has shaped it over the years. In fact, late summer/early fall is probably the best time for this hike, as the creek has mostly run dry so you don’t have to worry about slippery rocks or getting your feet wet. There were a few crossings where the water burbles up from underground, or where it pools in depressions, but these were easily navigated. The most dramatic parts of the canyon — where you’re wedged between grey rock walls that tower above — are early on in the hike. After awhile the creek bed widens and the rock faces soften into forested hillsides. We hiked until the creek flattened out, and turned around at a spot where hikers before us had built a cluster of inukshuks. They’ll probably be washed away during next spring’s runoff, but we made one all the same — our own natural treasure for another family to find. We ended the hike at a sort of Inukshuk shrine that’s been built up over the season in the dry creek bed. We celebrated by making our own contribution. If you go: Finding the “trailhead” is a bit tricky as there isn’t a sign or anything. It’s basically a turnout off of Highway 1A on the north side (take the Seebe/Exshaw exit from Hwy. 1, head toward Exshaw on the 1A), just across from the Graymont Plant but before the town of Exshaw. Various dirt tracks and trails head west and north toward a valley; you’ll know you’re on the right track when after a kilometre or so you emerge from the forest and see the gravelly reclamation effort around the creek’s washout after the 2013 flood. Turn right (north) and you can’t miss the start of the canyon. A view from the canyon entrance toward Exshaw. The gravel in the foreground is part of the post-flood effort. The mountains are my happy place. I was fortunate to spend many hours seeking out views and breathing in the scent of pine-baked trails this summer. 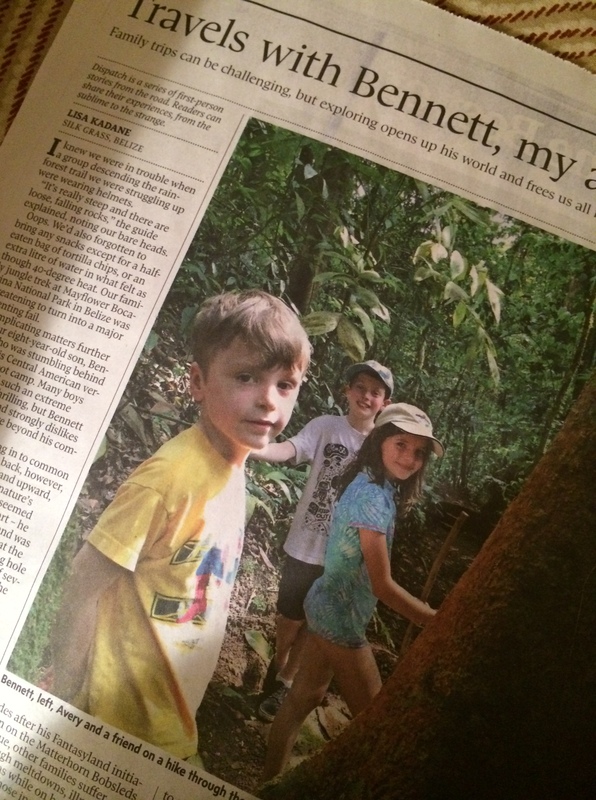 We haven’t hiked this much since 2012, when Blake and I were training for our Kilimajaro trek. What a difference four years makes! The kids actually enjoy hiking now. What’s more, they can go for ever greater distances, which means we can actually do some interesting hikes with rewarding views. This week and upcoming weekend are shaping up to be the nicest weather we’ve had in a while. 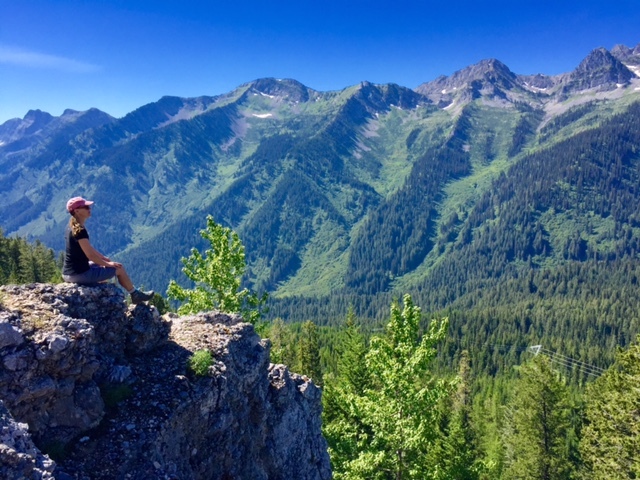 So, if you need some hiking inspiration, here’s the highlight reel from our summer in the mountains. 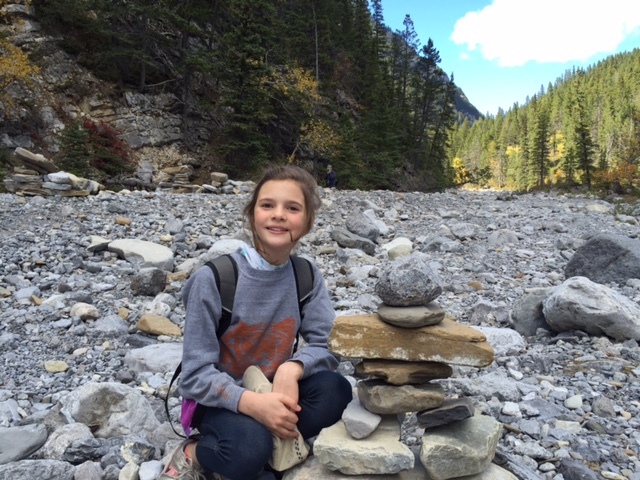 Best hike for kids: The Old Growth Trail in Fernie, B.C. gently ascends from Mt. Fernie Provincial Park four kilometres to Island Lake Lodge. There are bridges across streams, logs to balance upon, giant Western red cedar trees to hug and a pretty mountain lake at the end. 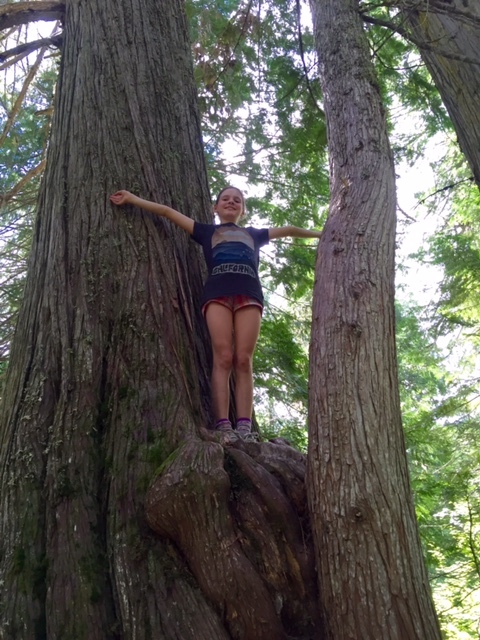 Avery stands on a Western red cedar along the Old Growth Trail in Fernie, B.C. 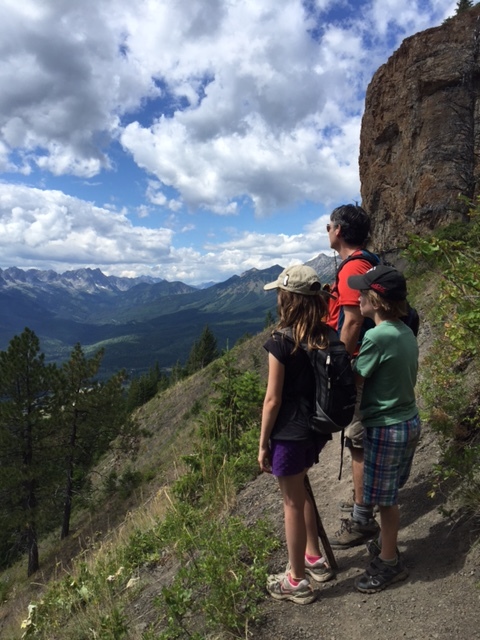 Bag a peak with kids: Our children made it to the top of their first “mountain” this summer — Castle Rocks in Fernie. It’s not so much a peak as a rocky high point of the Flathead Range on the Elk Valley’s east side. Avery and Bennett loved finding and eating five kinds of berries on the hike up (thimble berries, Saskatoons, raspberries, strawberries and huckleberries). They also liked picking out landmarks at the top like Fernie Alpine Resort and the Lizard Range across the valley. I couldn’t believe they hiked almost eight kilometres round trip! That moment when we reached Castle Rocks outcrop. 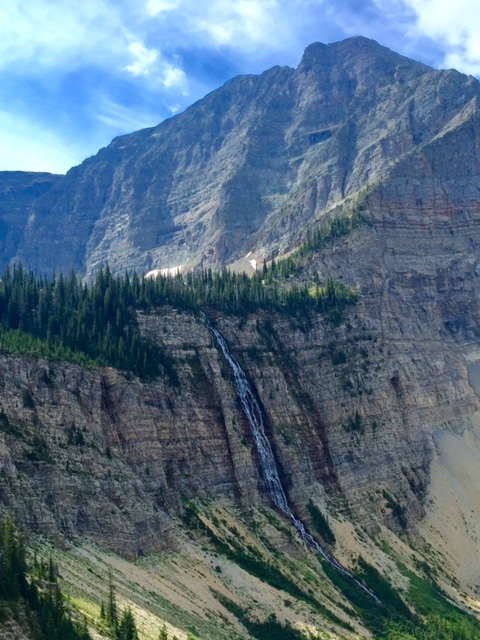 Most epic/Best variety: After 20 years of talking about it, Blake and I finally tackled the storied Crypt Lake hike in Waterton Lakes National Park. It’s been named Canada’s “best hike” and one of the “world’s 20 most thrilling trails.” That’s a lot of hype, but when a day hike packs in a boat ride to the trailhead, a 600-foot-high waterfall, a ladder climb, a 40-foot tunnel crawl, and a cable-assited cliff traverse, the thrills — and the stunning mountain cathedral views — are for real. Behind that waterfall wall lies Crypt Lake. I’d forgotten how much I love the mountain amphitheatres that make up this Alberta park. 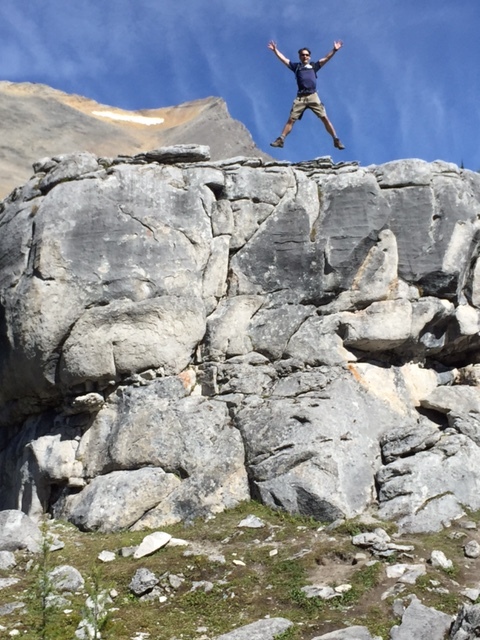 Most surprising: The Chester Lake hike off of Spray Lakes Road in Peter Lougheed Provincial Park, Alta. is a busy thoroughfare on a summer day, and it’s easy to see why. At four kilometres one way and only 310 metres of elevation gain, it’s a no-sweat way to get your wildflower and alpine lake fix. But venture beyond the glassy lake and things get interesting. Another hiker staying at nearby Mount Engadine Lodge gave us that tip and we were thrilled to discover a giant limestone rock slide deposit called Elephant Rocks not 10 minutes past Chester Lake. They look like something out of The Lion King and make a great scramble up for a snack break. We will return with the kids! This rock deposit left over from a rock slide looks more Serengeti than Canadian Rockies. 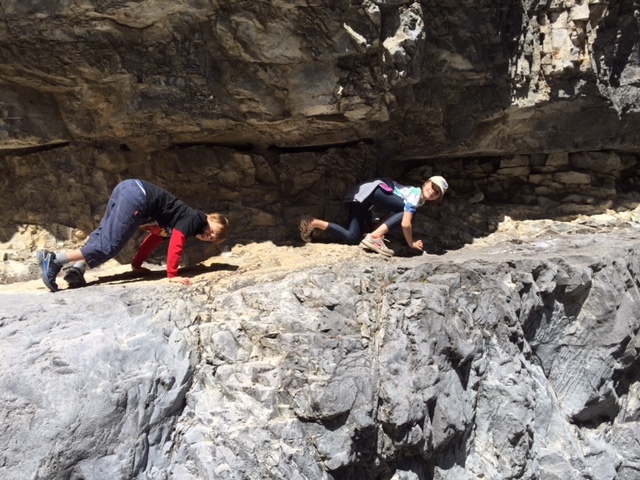 It was our favourite part of the Chester Lake hike. Most challenging/Best views: Before our stay at Mount Engadine Lodge, I had never heard of Tent Ridge. In fact, it’s not even listed as a trail on either of our 20-year-old Gem Trek maps of the Kananaskis area (it is an option on more recent versions). 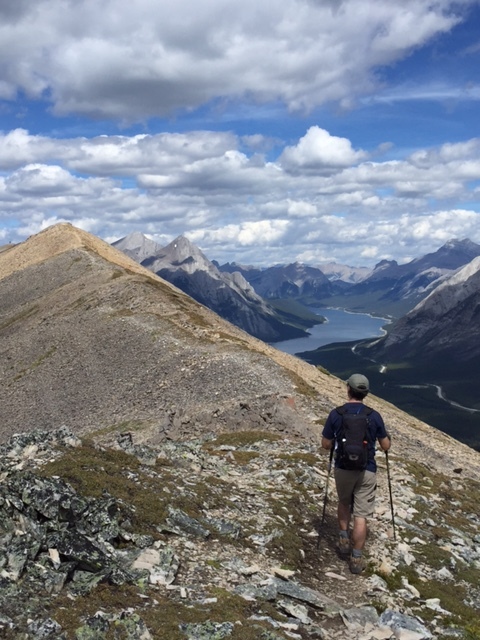 Not only is this hike mostly a ridge walk — you’re up in the alpine with spectacular views of the Rockies and Spray Lake for about six of the 11 kilometres — it’s also a loop! It’s a bit of a scramble to get up to the ridge, with some light route finding, but those challenges made us appreciate the apres-hike beers on the lodge’s deck all the more. The mountains seem to go on forever on this hike. 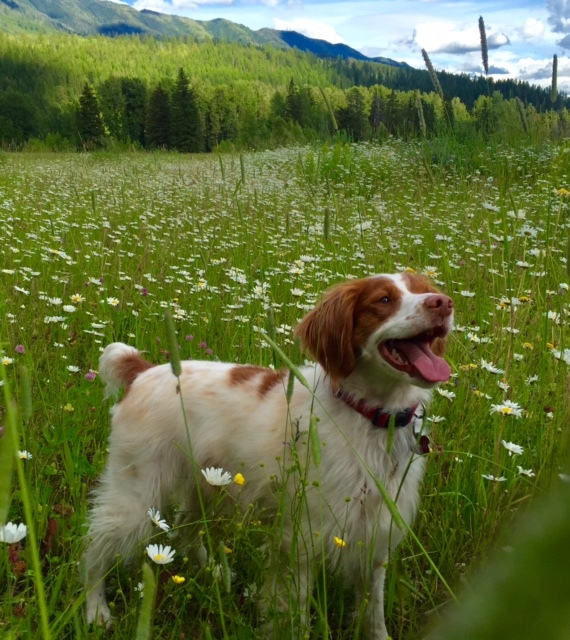 We’re planning to hike with the kids this weekend. Any suggestions? During low tide in Parksville Bay, on the east side of Vancouver Island, the beach stretches toward the horizon seemingly forever. Even better, when the tide’s on its way out, you can wade out into the shallow water quite a distance and never get your shorts wet. 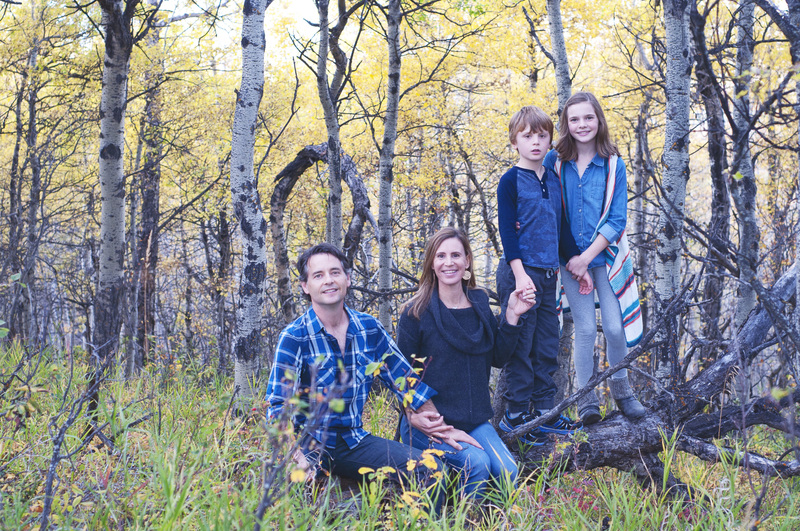 For our family, these conditions are just about perfect. Add in temps in the high 20s and it’s no wonder we packed our beach bag and hit the sand immediately after checking in to The Beach Club Resort. 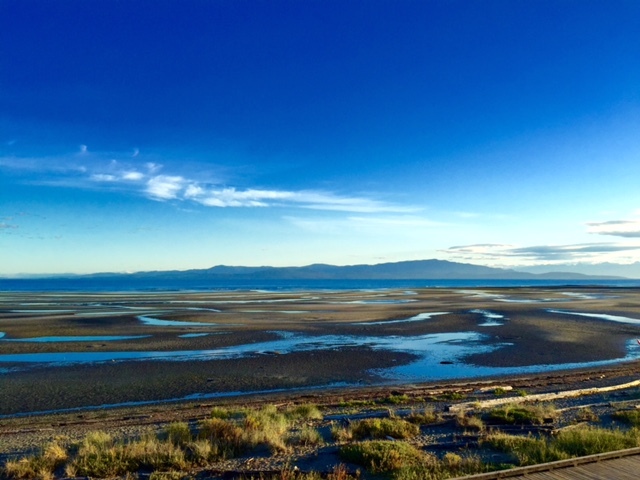 There’s sand for miles in Parksville during low tide. The view from our room at The Beach Club Resort. Bennett was in heaven swimming from puddle to shallow puddle, and we never worried he’d get in over his head (literally). 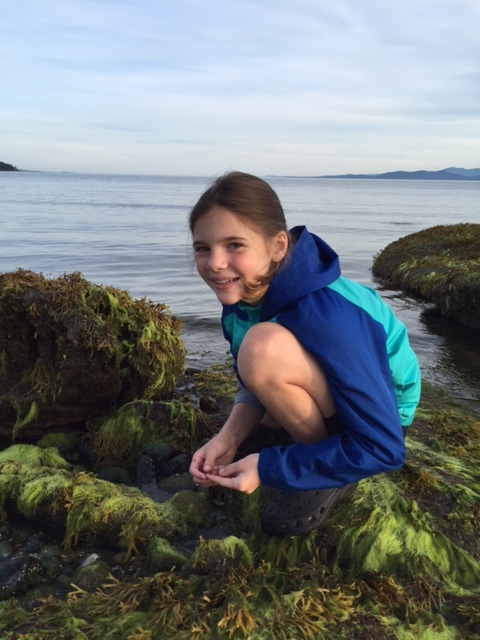 Avery turned her attention to all the critters getting left behind as the water drained toward the Salish Sea, including sand dollars, clams and tiny shore crabs that tried to hide unsuccessfully under beach rocks. Blake and I delighted in the kids’ happiness and tossed around a Frisbee. Paradise, found. Bennett in his happy place: a shallow pool of warm sea water. 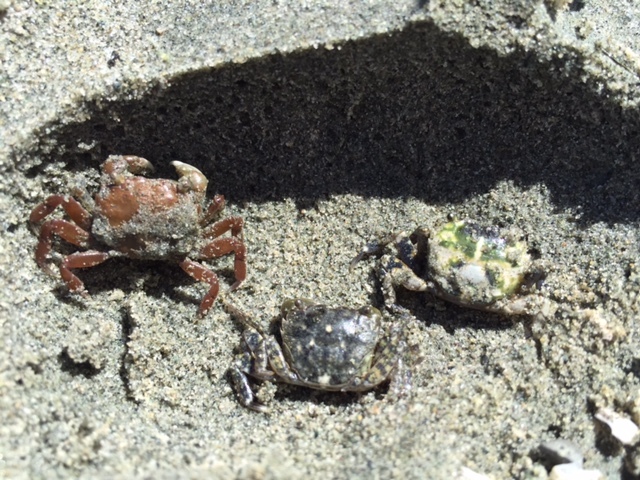 Three tiny shore crabs at nearby Rathtrevor Beach Provincial Park. 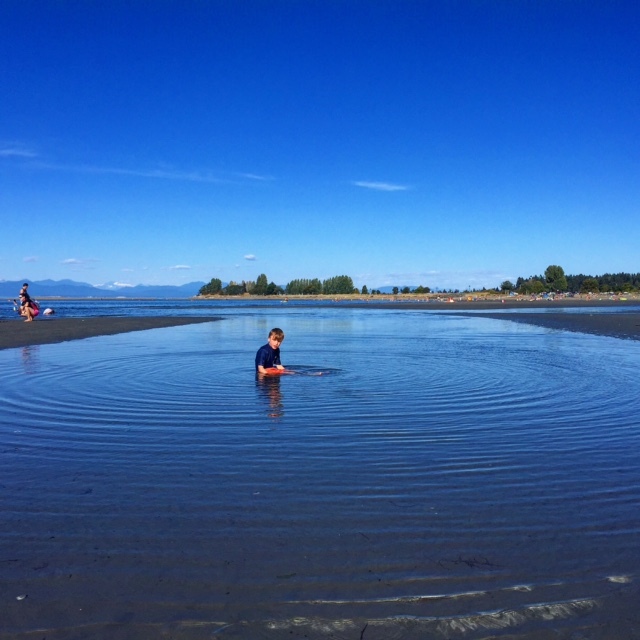 I’d been hearing for years that Parksville and neighbouring Qualicum Beach, a quick 30-minute drive north of the Nanaimo ferry terminal, was a perfect spot for families — warm calm water, fantastic tide pools and a ton of other things for kids to do beyond the beach. 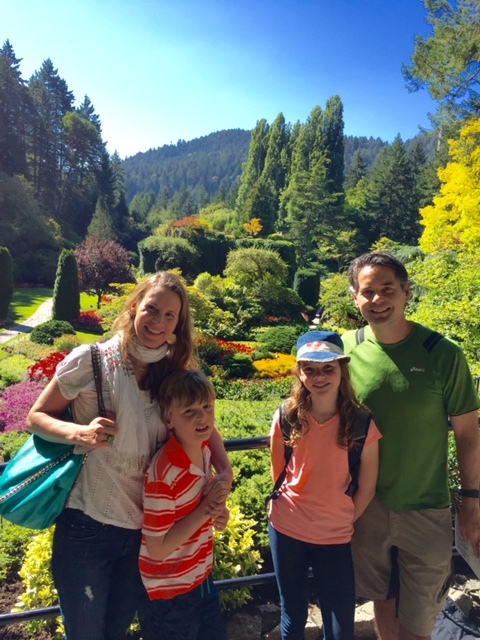 We’d never been to Vancouver Island with the kids and figured this would be the perfect initiation. After a lazy beach afternoon and a spectacular sunset, Avery and I were up at first light for a Salish Sea Tidepool Tour with Pacific Rainforest Adventure Tours. My little naturalist was in her element searching for critters in rocky pools of water and then picking up everything — even the sea slugs! 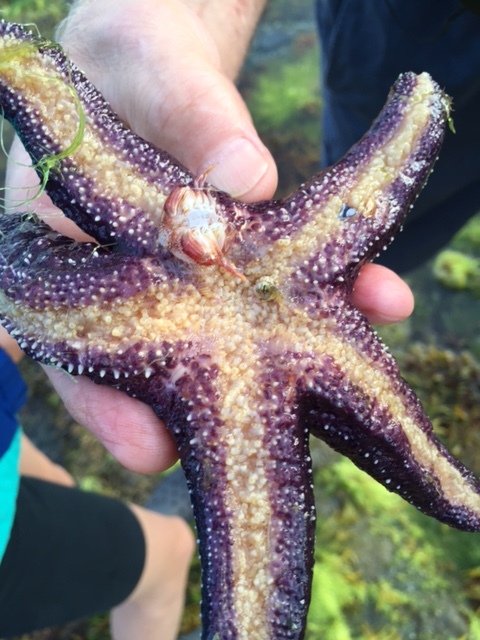 Our guide holds a purple ochre sea star. They were everywhere! 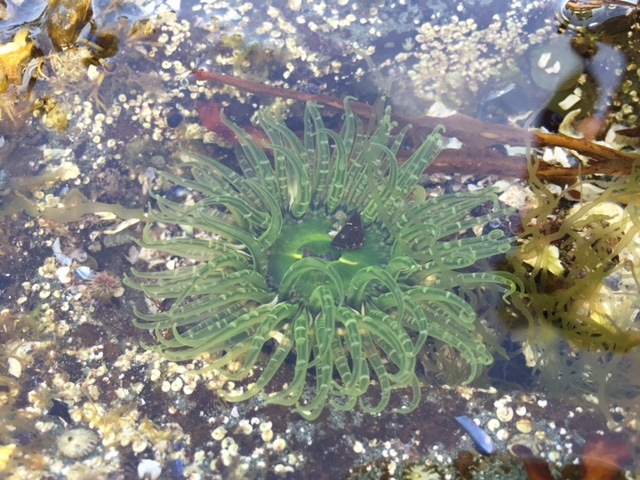 A neon green sea anemone. I was pretty amazed by all the life in the tide pools. We saw so many sea stars, shore and kelp crabs, and sea anemones that we lost count. We also spotted some unusual creatures, including a sea cucumber and the aforementioned sea slug. It was definitely worth waking up early! 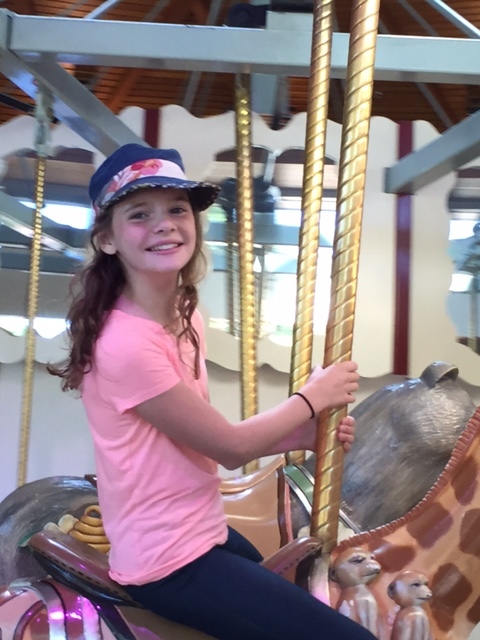 I think what made Parksville special — beyond its beach beauty — was just how excited the kids were to be outside and either in or near the water, swimming or exploring. As Avery nears the teen years and Bennett grows ever more interested in iPad games and gadgets, it’s pretty cool to see them still see the natural world with wonder. Too bad life isn’t a beach every day. Avery is in her element looking for critters in a tide pool.